This recipe was developed by Chef Scott Dolich of Park Kitchen in Portland, Oregon. For panna cotta: Lightly wipe eight 2-ounce size ceramic or metal soufflé cups with vegetable oil. In a medium saucepan, heat cream, milk, sugar, and lemon zest just to a simmer. Meanwhile, soften gelatin in 2 tablespoons cold water. Remove milk mixture from heat and stir in gelatin and tarragon. Let stand 5 minutes. Strain mixture through a wire mesh sieve or cheesecloth to remove tarragon leaves. Pour into prepared cups and refrigerate until firm, at least 8 hours. For caramel: In a small heavy saucepan (1-quart size) heat sugar, cream of tartar, and 1 tablespoon water until sugar is a deep amber color, stirring periodically with a fork or swirling to cook evenly. Immediately remove from heat and slowly pour cream down side of saucepan. The caramel will bubble up and clump. Stir until caramel is smooth. Stir in brandy. Cool, then refrigerate until thickened. yield: Makes about ⅔ cups. 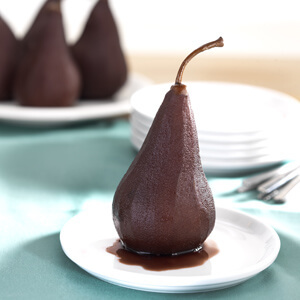 For pears: Peel, core, and cut pears into ¼-inch thick wedges. Combine pears, sugar, and butter in a wide skillet. 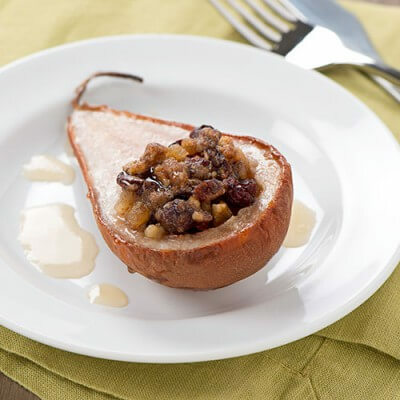 Cook and stir gently over medium heat until pears are lightly caramelized and tender, about 8 minutes. Spread on a platter to cool. To serve: Drizzle about 1 tablespoon caramel sauce on each dessert plate. Briefly dip panna cotta cups in warm water. Run the tip of a wet knife around edge of cups and invert onto prepared dessert plates. Divide pear slices between servings. Serve immediately.